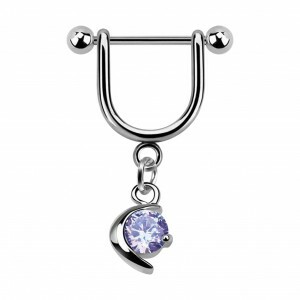 Stirrup Helix Piercing Ring Bar Jewel w/ Dangling Blue Crescent Moon Zirconia. This body jewel stirrup helix piercing ring bar jewel w/ dangling blue crescent moon zirconia made in 316L Surgical Steel & Zirconia, with Blue as the predominant colour, and with Metallic as a secondary colour, which the material of the bar is 316L Surgical Steel, and which the material of the ornament is Zirconia is proposed to you in 1.2mm/16G size, in 08mm (5/16") length and with 03mm balls. There are 2 other versions of this product: pink and white. 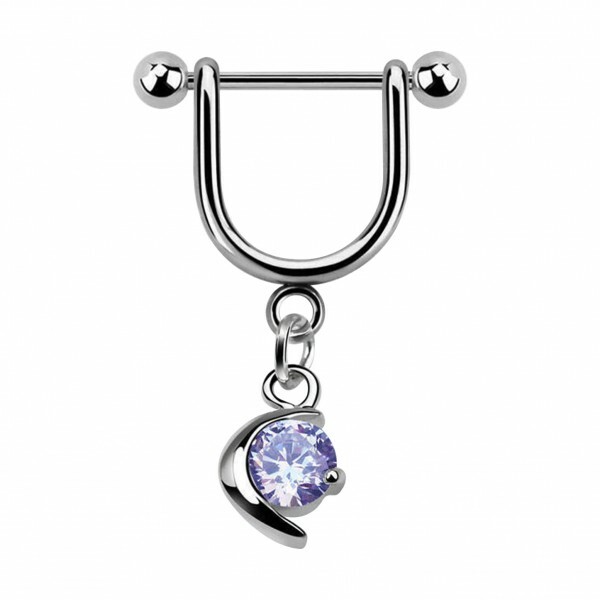 This product is often bough with stirrup helix piercing ring bar jewel w/ dangling pink dolphin cubic zirconia and 316l surgical steel tragus/helix bar jewel with white flat opal.